Stephen Cataldo Home Collection | brainstorms, drafts & plans on startups, tech, politics. How do we move forward? What compromises do we have to make, what compromises would destroy the movement? Democrats have carefully blazed out a trail that we need to avoid: compromising your values for short term gains. But we aren't going to be able to just avoid the questions. No movement can survive without vision: Let's fill the world with love and respect and beauty and solve racism and indigenous rights and homelessness. No movement can survive without some tangible, pragmatic successes: let's reinstate Glass-Steagall and institute a 0.1% tax on financial transactions. Can this be one movement, or will it split into two sides arguing about which it will be? Environmentalism is deeply, deeply needed. I'm not sure exactly how to make it fit with the theme of Wall Street and the 99%. Think about what you want to accomplish with Occupy. Now create two separate charts, audiences and timeline. Our movement. People who show up at least once to an Occupy event. Ordinary Americans have been silenced. Technically we live in a democracy, but both liberals and conservatives have seen the country slip out of our understanding. There are many voices calling Obama far-left, but even he seems absorbed by the old-boys network. If Wall Street held a gun to our heads and threatened a Great Depression if we didn't bail them out, why aren't more of them in jail, why are politicians of all stripes -- Obama to Tea Party -- friends with these thieves? Long ago in economics class, I learned that we produced the goods we needed with natural resources, labor and capital. Today we burn through more resources, have more capital, and have the best educated workforce in history. So why are we desperate? Why can't we pay for sufficient teachers for our kids? I'd like to hear your answers: why don't ordinary people working hard live lives that feel abundant? Why isn't providing adequate schools easy? What's changed? How do liberals and conservatives see fairness? The conservative definition of fairness is that you have wealth equal to the wealth you contribute to society: you get what you give. 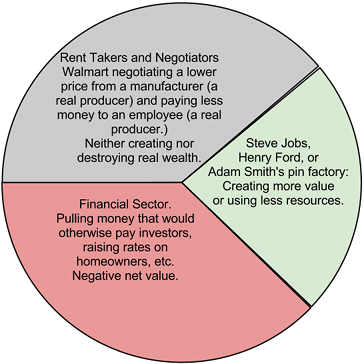 In the Free Market that Adam Smith defined, families are paid proportional to what they contribute, and what their parents passed on from their work. A fair day's pay for a fair day's work. Movements need slogans, and the 1% vs the 99% has caught attention. I want to dig deeper: who are the 1% that are getting richer relative to the rest of us? Do they earn their tremendous wealth? Download first draft as PDF or doc -- edit, steal content, print and hand out my version or yours, send me improvements!